Stanislav Petrov, a former lieutenant colonel for the Soviet Air Defence Forces, is credited with correctly recognizing a false alarm while manning an early-warning missile defense system, thereby averting a Soviet retaliatory strike and nuclear war. On 26 September 1983, just three weeks after the Soviet military had shot down Korean Air Lines Flight 007, Petrov was the duty officer at the command center for the Oko nuclear early-warning system when the system reported that a missile had been launched from the United States, followed by up to five more. On this day in 1983, Colonel Petrov simply saved the world. He was not even supposed to be on duty. He was replacing a sick colleague. Most of his colleagues — probably all of them — would have most likely followed the procedures. And it would have been the end of civilisation. If you are alive today, you owe him a great deal. Petrov died on May 19 2017 at the age of 77. A false alarm at a Soviet command center nearly led to nuclear war. 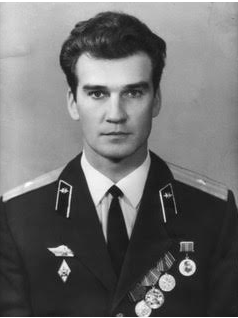 Stanislav Petrov , a lieutenant colonel in the Soviet Air Defence Forces, was in charge at a secret bunker near Moscow when an alarm sounded, indicating that the US had launched a nuclear missile. The incident took place at a particularly tense time during the Cold War, as the USSR had shot down a South Korean passenger jet in Soviet airspace just three weeks before. If the US launched a nuclear attack, the Russians almost certainly would have retaliated with a devastating counterattack. Fortunately, Petrov showed poise and restraint. He had a hunch the warning was a false alarm, and he held to that view even when the computer system reported the launch of four more Minuteman intercontinental ballistic missiles. Petrov later said the main reason for his conclusion was that the US would have launched a nuclear attack with a barrage of missiles, not five, to cripple the USSR. This entry was posted in Nuclear False Alarm, Stanislav Petrov, This Day in History and tagged Stanislav Petrov. Bookmark the permalink.